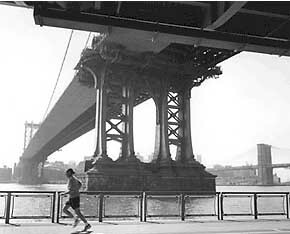 Blue Sky Gallery is currently showing a display of photographs by Douglas Lavere and Berenice Abbott. Side-by-side scenes of New York City are visuals of what the city looked like 60-plus years ago and in the much more recent past. Lavere made a project of repeating the point of view photos that Abbott took in the 1930s, replicating time of year, time of day, photographic equipment, and film type to show the changes that the city has undergone in the past six decades. It doesn't hurt that Abbott's original shots were compellingly composed and developed images of city life, both intimate and grand. 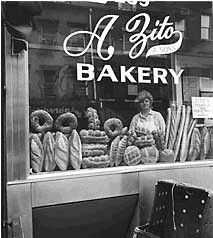 The before and after scenes of a bakery storefront show how a small business can stay in the same hands over the years, serving the same kinds of bread, the staple of life, while at the same time the superstructure of the city changes dramatically. When we see the location of the World Trade Center, minus the twin towers, next to the same vista with the iconic citadels, we can't help but envision them missing again in the imagined photo taken in the future. New York Changing remains on display through July 2. At Utrecht's Wall Gallery, between 11th and 12th on N.W. 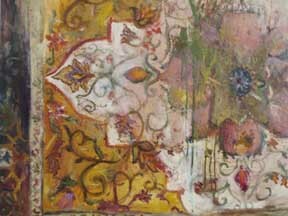 Everett, Tamara English shows a series of oil paintings, Ishk , which are representations of details of oriental carpets. English sees these as "interpretations of interpretations of what is found in the natural world," reflecting her interest in flora and fauna used in the man-(or often woman-)made. The paintings, with titles such as Kashmir and Mahavalla, are of varied sizes and dimensions. English uses a heavy impasto, and incorporates expressionistic drips, splashes and slashes to add a personal, painterly note. Whether she was creative with her palette or directly reproduced the colors of her models, the colors range from intense jewel-tones to pastels and are coordinated beautifully. This exhibit ends tomorrow, June 30.